"At the present time we have about 100 Stopper II units in service and they have reduced the amount of false alarm activation. In the past we have also used Weather Stopper II units to extend the life of pull stations in our pool areas. " "I recommend the STI Stopper II device wherever there’s a false fire alarm problem in our area as well as for new construction. That includes schools, hospitals and especially apartment buildings or anywhere else where there are kids around. Keep up the good work, STI. " "It isn’t that the grade school children are malicious, they're just curious about a manual pull station device and pull it to see what it does. Whenever this occurs, we suggest the use of the STI Stopper II and that takes care of it. " "With the increase in Alzheimer’s patients, false fire alarms used to be a big problem in two nursing homes in our area. We recommended installing STI Stopper II units and they have been highly successful. We call them our ‘Anti–Tamper Boxes’. " "We have a gymnastic studio here in town that was having problems with false fire alarms. We suggested they install STI Stopper II devices on their manual pull stations. No more false fire alarm problems. " "We continue to recommend the use of the STI Stopper II to help stop false fire alarms. In fact, copies of information on the devices are carried in the chief's vehicles to pass along to property owners and their representatives when the need arises. " "We protect a major state–owned hospital and we recommend STI products to alarm system vendors working at our facility of 50 buildings. 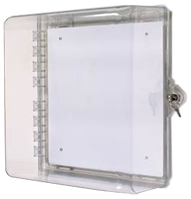 That includes STI Stopper II covers for our manual pull stations, STI Wire Guards for smoke detectors, protectors for our fire extinguishers and a lot more of them. In fact, we give all our fire protection vendors copies of your catalog. " "Stopper II solved our problem. It helps protect the fire alarm from small children pulling it out of curiosity. Now children can easily and safely wander around my salon without fear of them pulling the fire alarm. " Douglas R. Lakes, Tech. Svcs. Jim MacNeil, Hospital Maintenance Tech. Sr.
"Our STI Stopper II units keep the small visitors to our offices from pulling the fire alarm. They are great! " "We average 1,000 visitors a day but since we installed our STI Stopper II units our false fire alarms from pull stations are down to only one or two a year! " "The residents at the home were continuously leaving the emergency exits doors open, which became a safety and security risk to the residents and staff. After sorting advice on how to tackle the problem, the local fire officer recommended the Exit Stopper. Since they were installed, it has proved very successful deterring the residents from misusing the Emergency Exits. It has also given the staff piece of mind especially during the night shift." " Actually, we love this area and our Black Bears are a vital part of it. But they really are burglars—constantly in search of any kind of food wherever they can find it. And often, that's in the kitchens of homes and cabins. It was a severe problem and we tried just about everything to solve it—pest control products, Pine Sol, chemicals of one kind or another, motion activated alarms and so on. Nothing seemed to work. Then someone mentioned electronic barking dog alarms. People depend on our advice so we tested all of them—eight different kinds from eight different companies. Based upon their effectiveness, dependability, price and other factors the clear cut winner turned out to be STI’s Rex Plus Electronic Watchdog. We ordered cases and cases of them. The word went out. And people lined up to buy them. Bottom line: Rex works. It has indeed helped solve our problem with bears breaking into residences for food and the resulting destruction. Bears no longer are creating havoc in their quest for something to eat before going into hibernation. As far as the bear is concerned, he or she is totally convinced the home that is protected by Rex is guarded by a large, vicious and very angry German Shepherd. It helps too that the closer the bear gets, the louder and angrier Rex becomes. The bear wants no part of that and quickly trots off. We think Rex is great! In fact, we have already placed an order for a whole new shipment of them." "We have been using the Lunker Lifter on our fishing trips since at least 1998. We like to use it for the following reasons: safety, speed and ease of use. Fish teeth are very sharp and can cause accidents. The Lunker Lifter makes it much easier and safer to hold the fish while removing the lure. Also, we catch and release our fish and your product helps make the release faster. When a net is used, it takes more time to remove a lure, especially after the fish flops around in the net and tangles everything. The Lunker Lifter has a roomy, comfortable grip and is designed to make insertion in the fish very easy. It is durable and sturdy. Thanks STI, for making such a great product!" "Churches Fire Security Ltd. has been installing the STI ReSet Call Point over the last 12 months. We have installed in excess of 500 and have found them to be very easy to install and extremely reliable. The option of different resistance and dead short terminals, allows our engineers to install these call points to all standard non addressable systems. Our customers find the call points to be very easy to use; we have also noticed that the sites that have these call points no longer call for help due to test keys jammed or glasses dislodged or broken etc." "We came across your products on the internet whilst searching a way of stopping clients staff constantly changing the air conditioning set points. As an installation and maintenance company looking after air conditioning on behalf of our clients, we have installed many of your Thermostat Covers over new and existing controllers. This has allowed for the cooling/heating mode and the temperature set point to be preset and locked away in the polycarbonate key locked cover so that only authorised personnel and our maintenance staff have access. This results in a far better controlled environment but also allows staff to see the operating set points for the systems. These controllers certainly help reduce nuisance calls when staff have inadvertently set the operating mode incorrectly." "Thank you for your company’s prompt attention to our order. We found details of your company and the products from a search on the internet. We have installed the cages and they are effective and combated the vandalism problem we were experiencing, thank you. We will recommend your company and your products to others in our community and other Scout and Youth Groups." "The Exit Stopper alarms have been installed on our emergency exit doors of our medium sized pharmaceutical production plant in the UAE in Jabel Ali some 20 odd miles outside Dubai. These doors can be opened from inside with just one press and push of the bar handle and the purpose is for easy escape in case of fire or any kind of emergency. In case of an opened door we wanted to know where, to take immediate counter action and to avoid outside contamination entering the plant or corridors. This is mainly to avoid someone from production opening the exit doors unnecessarily. We picked you up as a supplier through the Google search engine fire alarm doors and found a good product description with all details and good value for money. Thank you for your efforts. Until today no one has dared to open the door again knowing that a big noise is expected!!" "We had an intermittent problem with pupils activating the break glass call points in our automatic fire systems. Each alarm led to attendance by the local fire brigade but also led to considerable inconvenience, as all of the buildings in the school complex had to be evacuated every time an alarm was given. Since Derbyshire County Council Technical Services Department installed the Stoppers, not a single false fire alarm has been recorded. " "We installed fire alarm systems in all secondary schools under Local Education Authority responsibility as part of a rolling programme – some 30 schools in total. The novelty of break glass call points and children being children meant that false fire alarms were occurring, in one school in particular during exam time which proved especially disruptive. We have now installed Stoppers in all the schools and it generally does appear to have curbed the problem. Tt’s a good device and we will certainly consider using it again in similar situations." "We found your cages via “Google” doing a search for smoke detector guards. Both our applications are for Prison sites in New South Wales where the guard provides protection against possible vandalism to our smoke detectors by the inmates. Previous products have failed or have introduced a means of the inmates inflicting harm. To date, we have not received a feedback to suggest that your STI 8200-SS’ have succeeded or introduced another hazard. The fact that they have ordered the second lot of 50 would seem promising." "Pendennis’ is a small dorma bungalow which offers two double rooms for guests. Given the relatively small size of the business, I needed a cost effective product which would suit our requirements. The Alert Point wasn’t too expensive, was easy to purchase directly from STI and arrived quickly. It was also easy to install so I didn’t have the extra cost of an electrician and, once installed, was set up so that it could be used straight away. The Alert Point is installed in our hallway and can be heard clearly throughout the B&B. It’s been in for some three months now and thankfully I’ve not had to use it but it is comforting to know that it is there if needed. I do test it on a regular basis which is easy to do as I can reset the unit quickly without having to replace any parts." "Our school had a sizeable problem with malicious activations (3 in a day) and a solution was required. Having used a STI Europe product in the past, to cover fire detector heads that were vulnerable to tampering, they were the obvious choice to start my search. My initial impression of the fire stopper was that it was too expensive with no guarantee of success. Sales staff were more than helpful in every regard, sending us an example for our perusal and use as a precursor to purchase. We have now purchased an alarmed stopper for every break glass that is accessible to students and to date, some 6 months after installation, we have had no malicious activations. A quality product provided by a proactive, obliging organisation." "The Stopper II with sounder is a great product and has helped my customer to almost iradicate a problem he had with drug users in rehab smashing the break glass units to get out the back door.STI are a pleasure to deal with, always so helpful and poilte.Sam and the girls are a credit to the company"
"We experienced a high incidence of students breaking call points and setting off fire alarms. Since we installed Stoppers, we only had one incident."